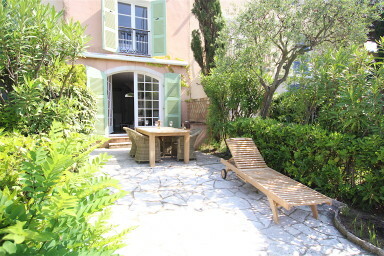 Lovely renovated fisherman house in the private area of Port Grimaud South, close to the facilities. On the ground floor: a living-room with an open kitchen. On the 1st floor, one bedroom with a large bed, a second bedroom with two single beds, a shower-room and separate toilets. On the second floor, a large master bedroom with a large bed, a balcony and a shower-room. A/C in the master bedroom. On the canal side a big terrace leads to a 14m x 4,20m mooring. A private parking space near-by. A fresh house perfect for the summer very hot days !